Latest Dance Costume Jackets and Hoodies for sale online in a variety of styles from top dancewear brands. Natalie Womens Mesh Yoke Hooded Dance Sweater DS5133: This multi-functional sweater is stylish, comfortable, and can be worn to dance class, rehearsal, or for a casual day off! Sweater features an attached hood with drawstrings, a mesh yoke front and sleeve panel, and buttery soft, lightweight fabric. Dance Department Adult Cropped Short Sleeve Ripped Hoodie D3020: Edgy ripped cropped hoodie feature a soft, stretch material, a scoop neckline, short sleeves, and distressed back rips. Pair with the matching ripped sweat pants for a complete outfit that's both cute and comfy! Double Platinum Adult Sequin Varsity Jacket N7218: Get in the spirit with this sparkly sequin varsity jacket! Features a super soft fleece fabric, sequin sleeves, and a black and white rib knit stripe trim on the neckline, waist, and arms. A performance must-have! Double Platinum Girls Sequin Varsity Jacket N7218C: Get in the spirit with this sparkly sequin varsity jacket! Features a super soft fleece fabric, sequin sleeves, and a black and white rib knit stripe trim on the neckline, waist, and arms. A performance must-have! Elisse by Double Platinum Girls Long Sleeve Dance Jacket N7487C: Take on your next dance mission with style! This edgy long sleeve jacket features a metallic high neck collar, upper and lower back cutout, long mesh insert puff sleeves, metallic striped lower front bodice, and working front zipper. Natalie Womens Full Zip Hooded Warm Up Jacket N9082: Merging style, comfort, and functionality - Natalie's warm-up pieces feature soft to the touch fleece and trendsetting silhouettes. This fashion forward jacket features a functional full zipper, cuffed long sleeves, an attached hood, and an open back with twist detail. Elisse by Double Platinum Womens Plus Size Long Sleeve Dance Jacket N7487P: Take on your next dance mission with style! This edgy long sleeve jacket features a metallic high neck collar, upper and lower back cutout, long mesh insert puff sleeves, metallic striped lower front bodice, and working front zipper. 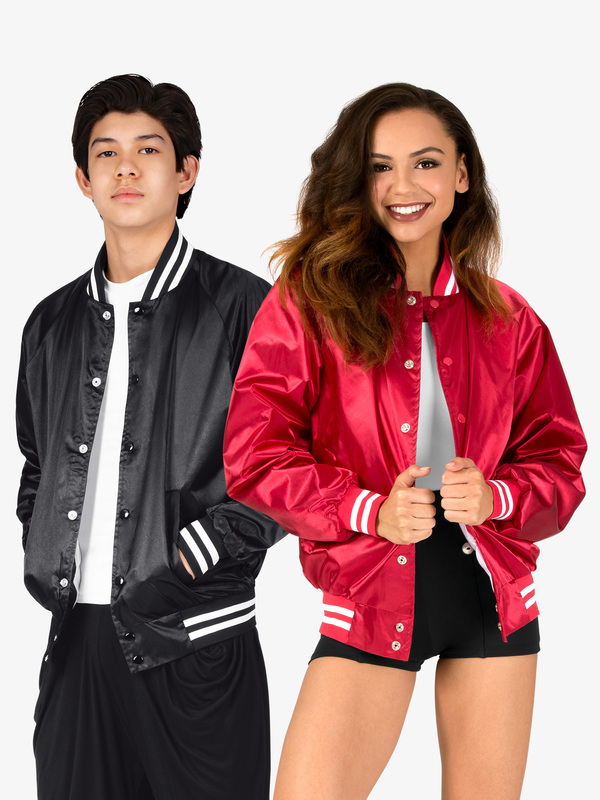 Augusta Adult Unisex Satin Sports Jacket AUG3610E: This sleek long sleeve jacket features a mock neck with striped detail, luxurious nylon satin fabric, full lining, snap front, front snap button closures, front pockets, and cuffed sleeves and bottom with striped detail. Augusta Ladies Freedom Jacket AUG4810: This comfortable ladies fit jacket features a moisture wicking fabric, front zipper with zipper garage, raglan sleeves with thumbholes, front seam pockets, and contrast color inserts on the back of collar, shoulder, and front. Augusta Girls Freedom Jacket AUG4811: This comfortable girls fit jacket features a moisture wicking fabric, front zipper and zipper garage, raglan sleeves with thumbholes, front seam pockets, and contrast color inserts on the back of collar, shoulder, and front. Augusta Ladies Zip Up Jacket AUG4816: Keep warm in style in this trendy zip-front jacket! Features a 4-way stretch moisture wicking brushed back polyester/spandex knit, a flattering ladies fit, front zipper with zipper garage, thumbholes, feminine rouched front pouch pockets, and tagless label for added comfort. 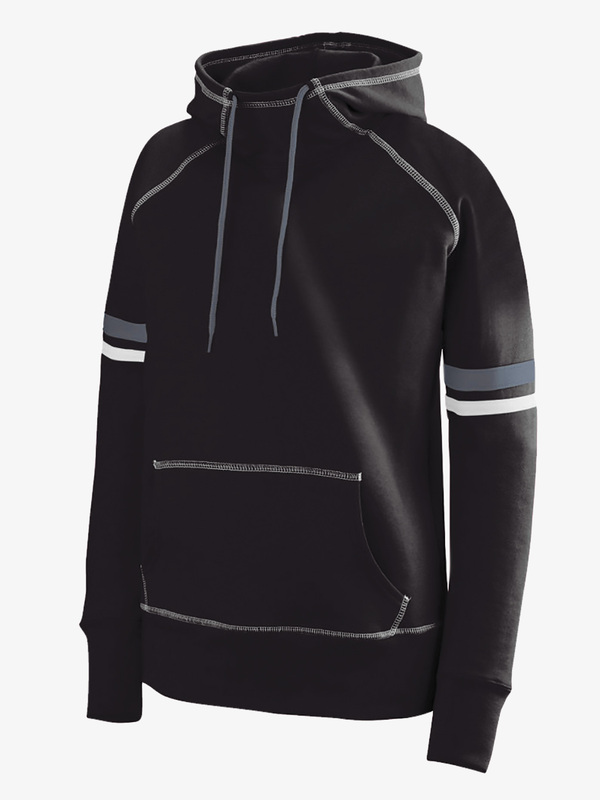 Augusta Womens Drawstring Hooded Active Sweater AUG5440E: Support your team or studio with this athletic sweater featuring an attached hood with contrast drawstrings, long sleeves with contrast stripe detail and thumbholes, a front pouch pocket, and contrast stitching. Sizes x-small and small do not have drawcord. Augusta Ladies Brushed Tricot Zip Up Jacket AUG7735: This super trendy zip-up jacket features a heavyweight polyester matte brushed tricot fabric, a flattering ladies fit, contrasting asymmetrical cross body stripes, front pockets, and half elastic cuffs. Augusta Girls Brushed Tricot Zip Up Jacket AUG7736: This super trendy zip-up jacket features a heavyweight polyester matte brushed tricot fabric, a flattering ladies fit, contrasting asymmetrical cross body stripes, front pockets, and half elastic cuffs. Balera Unisex Zip-Front Hip-Hop Vest: A bold, stylish, unisex vest with an asymmetrical, contrast zipper, a stand-up collar and plenty of stretch to provide comfortable range of motion during hip-hop routines. Imported.Fabric : Polyester. Balera Feather-Accent Mesh Shrug: Dramatic shoulder shrug featuring sequin appliqus at the shoulders and a mesh back yoke and cap sleeves. A spray of feathers frames the neck in back for a bold, showgirl look. Imported. Balera Wide Shoulder Twill Tailcoat: This menswear-inspired jacket has a structured fit with a stand-up collar, long coattails and an exaggerated shoulder silhouette enhanced by built-in shoulder pads. Fully lined. Imported.Fabric : Cotton/Polyester/Spandex. Balera Sequin-Shoulder Denim Vest: This denim vest stands out with bold Sequin Performance panels across the shoulders. Additional details include a frayed hem and functional buttons along the placket. Imported.Fabric : Cotton/Polyester/Spandex. Balera Faux Leather Moto Vest: A faux leather vest with pintuck detail on the back shoulders. The notched collar has snaps and a functional zipper. Faux front pockets are accented with decorative zippers. Imported.Fabric : Polyester/Spandex. Balera Stretch Twill Military Vest: This military-inspired, stretch twill vest features a mock neck collar, functional front zipper and faux button detailing on the front. The back has pintuck details along the shoulders. Imported.Fabric : Cotton/Spandex. Balera Chevron Stripe Track Jacket: A zip-front track jacket with chevron insets and a ribbed collar, cuffs and bottom hem. Imported.Fabric : Polyester/Spandex. Balera Colorblock Windbreaker Jacket: This lightweight windbreaker features a color-blocked design with a mock neck collar and a functional zipper in front. Imported.Fabric : Polyester/Nylon/Spandex. Balera Checkerboard Bomber Jacket: This lightweight bomber jacket features a checkerboard print with rib knit cuffs, collar and waistband. With a functional zipper and pockets in the front. Imported.Fabric : Polyester/Nylon/Spandex. Balera Moto Detail Military Jacket: This military-inspired jacket features one decorative zipper and one functional zipper in front with quilted pleather accents on the sleeves. Constructed of stretch twill with shoulder pads and princess seams in back for a structured fit. Imported.Fabric : Cotton/Polyester/Spandex. Balera Mesh Sleeve Tuxedo Jacket: This tuxedo-style jacket is made from strechy bengaline fabric and features a faux leather lapel with a hook-and-eye closure in front. The long sleeves are made from power mesh. All sizes are fully lined in the bodice. Imported.Fabric : Rayon/Nylon/Spandex. Balera Zip-Front Track Jacket: This bold, stylish, unisex track jacket with kangaroo pockets has plenty of stretch to highlight your every move. With a functional, contrast zipper. Bra top not included. Imported.Fabric : Polyester.Please note, Chartreuse and Magic Pink have black zippers. All other colors have white. Balera Reversible Quilted Vest: This snap-front quilted vest is reversible for flexible style options. Both sides feature athletic striping on the rib-knit collar and waistband. Imported.Fabric : Polyester. Balera Buffalo Plaid Hooded Vest: A stylish, hooded buffalo plaid vest in comfortable cotton flannel. Snap closure allows for versatile styling options. Bra top not included. Imported.Fabric : Cotton/Polyester. Balera Moto Vest: This matte neoprene moto vest features decorative snap details on the notch collar and an asymmetrical zip closure. Imported.Fabric : Polyester/Spandex. Balera Satin Bomber Jacket: Lightweight and on-trend, this satin bomber jacket features rib knit cuffs, collar and waistband, functional pockets, and a front zip closure for versatile styling options. Imported.Fabric : Nylon/Polyester/Spandex. Balera Striped Sleeve Satin Bomber: This lightweight satin bomber jacket features color-block sleeves and rib knit cuffs, collar and waistband. With a functional zipper and pockets in the front. Imported.Fabric : Nylon/Polyester/Spandex. Balera Faux Leather Jacket: This lightweight, faux leather jacket has princess seams, extended rib knit cuffs and a wide rib knit bottom hem in back. The front zip closure allows for versatile style options, and the stand collar features a functional snap detail. Bra top not included. Imported.Fabric : Polyurethane/Polyester. Balera Cropped Metallic Jacket: Cropped jacket made of Premium Metallic nylon/spandex with elbow-length sleeves and a front zip closure for versatile open or closed styling. Bra top not included. Imported.Fabric : Premium Metallic Nylon/Spandex.New colors available! Now in Electric Purple, Kelly and Royal. Balera Ultra Sequin Bomber Jacket: This bomber jacket features an Ultra Sparkle bodice with stretch satin sleeves and ribbed collar, cuffs and waistband. With a zipper in front. The sequin bodice is unlined; all sequin seams are clean finished for comfort. Imported.Fabric : Polyester/Nylon/Spandex. Balera Ultra Sparkle Crop Jacket: This long sleeved cropped jacket is constructed from Ultra Sparkle sequins and has a black rib-knit waistband and cuffs with a front zipper. Bra top not included. Imported.Fabric : Polyester/Cotton/Spandex. Balera Ultra Sparkle Shrug: This high-energy, asymmetrical shrug made of Ultra Sparkle sequin spandex features a flattering mock neck and a single point sleeve with a peaked shoulder detail. Fully lined. Bra top not included. Imported.Fabric : Polyester/Spandex.Metallic Bandeau Bra Top (ML6968) sold separately. Balera Ultra Sparkle Tuxedo Jacket: Ultra Sparkle sequin spandex cropped jacket with a black satin collar. Shoulder pads provide structure for a sophisticated look. A single hook-and-eye closure allows for easy on and off. Fully lined. Imported.Fabric : Polyester/Spandex.Please note: Jacket and top are sold separately. The bra top shown here is MT9908 Bra Top With Pinched Front. Ivy Sky Performance Crystal Tuxedo Vest: This tuxedo vest is made from bengaline fabric with a stretch satin lapel embellished with crystals from Swarovski. The collar is made of stretch velvet. Swarovski crystals have 4x more facets and 2.5x the brilliance of acrylic rhinestones. The vest has princess seams and is fully lined. Imported.Fabric : Rayon/Polyester/Spandex.Crystals range in size from ss16 to ss20. Both colorways feature Crystal-colored crystals. Child sizes have an average of 73 crystals; adult sizes have an average of 83 crystals. More at Dancewear Solutions and Discount Dance Supply.